Hello, my name is Kate, and I cannot stick to a recipe. Is this shakshuka? I made it up, I didn’t follow a recipe, and I am consistently inconsistent with how I make it each time. It’s not at all authentic. So it’s eggs, baked in a tomato sauce. Possibly with some spices. Or whatever I find hanging around in the fridge. Not shakshuka. I actively tried to make notes on this occasion and still neglected to record how much spinach I used, or what quantity of spices I threw in. I’m not even really sure which spices I threw in, which is a shame as it turned out pretty well. I also forgot to take a photo of the finished dish the first time around so I made it twice in less than a week. Blog fail. I usually cook (and serve) this in a medium-sized frying pan. You can use a cast iron skillet, which would look nicer on the table, or any other similar sized pot or pan that is happy on the hob. Fry off the onion until it has a bit of colour, then add the garlic and continue to cook for a couple of minutes. Add the spinach leaves, turn down the heat and cover with a lid. Let the leaves steam and wilt for a couple of minutes. In a small blender add the tomatoes and the onion-spinach mix. Blend briefly, you don’t want the sauce to be completely smooth. If you leave out the spinach you’ll have a more red, vibrant-looking sauce, with the spinach it tends to look more brown but you get more veggie goodness in there. In the same pan you used for the onions fry off the chorizo until it browns and releases its oils. Remove from the pan. Add the wine, turn up the heat and deglaze the pan. Add the tomato sauce back to the pan with the wine, add in the drained beans, your chosen spices and seasonings (I used paprika, white pepper and thyme), a pinch of salt and half a teaspoon of white sugar (this balances the bitterness from the canned tomatoes), and leave to simmer for at least 10 minutes, longer if you can. Once the sauce has been simmering a while, taste to check for seasoning, then add the eggs. You want the sauce to be hot otherwise you’ll need to cook the eggs for longer and the yolks will go hard. Make divets in the sauce and crack the eggs into the pan. Dot the halved cherry tomatoes around the pan, and sprinkle the grated courgette and cheese over the top. Cover with a lid and cook for 3-6 minutes, checking the whites of the eggs are set. Do not overcook as the eggs will continue to cook in the hot sauce once the pan is removed from the heat. Serve, in the pan, with crusty bread on the side for scooping and mopping purposes. I am the same way with recipes! 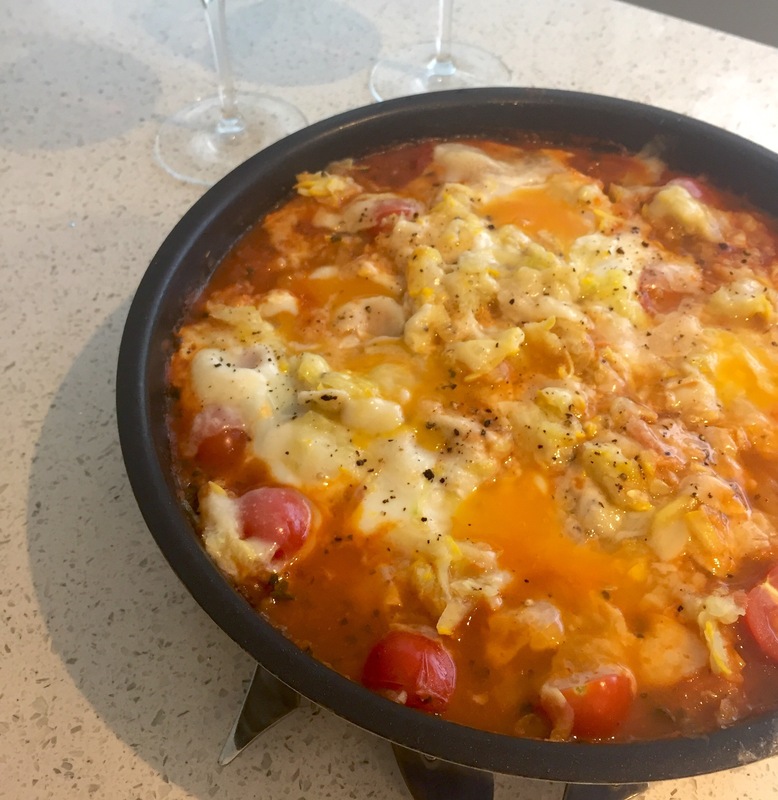 Your version of shakshuka sounds delicious!